In a recent post from Harald Hordosch, designer of the Seacam housing, we have been alerted to some problems users have been experiencing with dual strobes. It has been particularly vexing with the D2X as shooters have had images disappear mysteriously, failing to write to compact flash card. In Harald’s words "We had no problems with the configuration I recommended in the past, but during our research to find the perfectly working i-ttl and e-ttl strobes (our Seaflash 250), we found out some new things. The problem occurs when shooting 2 strobes! For this reason we have developed a special DUAL STROBE CONNECTOR which will be built into all shipped housings for 2006, and also can be retrofit by authorized SEACAM service centers. These SEACAM hot shoe configuration sheets show how to adjust Nikon and Canon housings without this connector. SEACAM is the only company which offer this very flexible hot shoe system!" Please note that directions on how to remove and reset pins, without tools or cutting wires, are included in the data sheets. Operating a digital camera with an underwater flash needs to adjust your hot shoe to the demand which flash you use! For preparing the hot shoe at your SEACAM housing you easily can remove the golden pins by bulling them out with your fingernails or a thin knife. 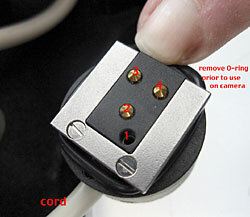 Replacing back, you push them in again and place them in position with a pen or a thin insert-key. For using the fully CANON e-ttl the SEACAM S6 socket is necessary to be installed.